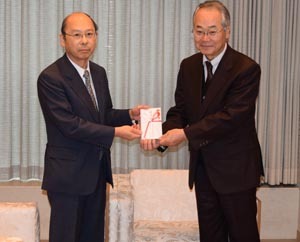 The National Research Institute for Cultural Properties, Tokyo received offers of donations from Tokyo Art Dealers’ Association (Director: Jun NAKAMURA) specifically to subsidize public release (publishing projects) of the research results of the Institute and from Tokyo Art Club Co., Ltd. (President: Tadahiko MITANI) specifically to subsidize the research projects of the Institute. 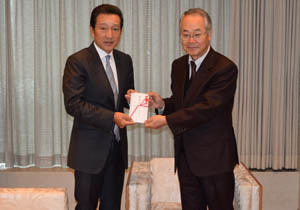 The donations were received at Tokyo Art Club on December 17th and, as an expression of gratitude, a letter of appreciation was presented by Director General Kamei each to Director Nakamura of Tokyo Art Dealers’ Association and President Mitani of Tokyo Art Club. The Institute expresses deep gratitude for the donations that were made based on kind understanding towards the projects of the Institute and will make the best use of the donated money for the projects of the Institute. On December 17th, students of the Fieldwork Introductory Course, which has been run with the aim to develop human resources who are capable to conduct research on and make effective use of regional cultural assets, visited the Museum to learn, for their future activities, correct knowledge about cultural assets and protection of cultural assets. 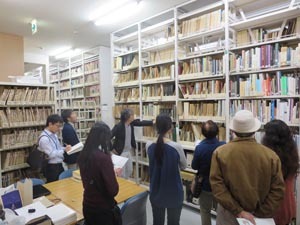 Students were given an explanatory tour by Mitsuru IIJIMA, Director of the Department of Intangible Cultural Heritage, Naoto YOSHIDA, Head of Conservation Science Section), and Tetsuei TSUDA, Head of Archives Section. 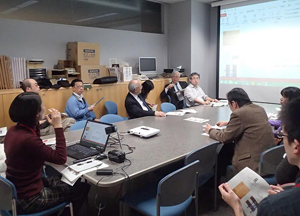 The Department of Art Research, Archives and Information Systems held a seminar on December 22nd, 2015, where Kyoko ISHII of the Center for Conservation Science and Restoration Techniques made a presentation on the topic: “Possibility and acceptability of past refurbishing of Red and White Cotton Roses. It concerned Red and White Cotton Roses (designated as a National Treasure and owned by Tokyo National Museum), paintings signed by the Chinese court painter Li Di in the Chinese Southern Song dynasty in 1197. At the presentation, she reported on accurate depiction of details as well as her perception on inpainting added by posterity based on the results of various kinds of optical examinations using infrared rays, x-rays, etc. Based on the detailed map of damages that remain on the paintings, she also reported the possible refurbishing made by posterity. Large longitudinal bending lines exist on both paintings. Today, the paintings of white cotton roses and red cotton roses are said to be a pair of hanging scrolls. However, it can be possibly presumed from these longitudinal bending lines and inpainting that they were originally made as a picture scroll, which were then trimmed and made into hanging scrolls. Ishii further reported that the both paintings had already been recognized each as an independent painting in the early Edo period and provided with unique values added in Japan. The two large longitudinal bending lines on both paintings occur in an equal interval on each of the paintings that are different in nature from longitudinal bending lines observed in ordinary picture scrolls. Ishii’s presentation was followed by a lively discussion as to possible causes of these lines, as to a question arising on the signs on the pictures if they had been a picture scroll, etc., thus disclosing and posing a series of interesting problems. 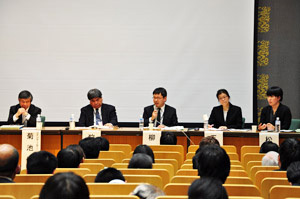 The 10th Conference on the Study of Intangible Folk Cultural Properties was held on December 4th, where reports were presented and discussions were held on the topic titled “Outward-facing intangible cultural heritage―Transmission of attractiveness and external power” by four presenters and two commentators. There have been a number of cases reported where, in the process of restoration after the Great East Japan Earthquake, the attempt taken by the severely afflicted areas to bring in “external power” has resulted in contributing to inheritance of culture. Through the attempt, I-turn & U-turn migrants, tourists, and other new groups of people who had never been involved in cultural inheritance activities in a community came to take part in those activities (expansion of successors) and came to transmit patrimonies to new audience and supporters (expansion of receivers). In this regard, when having intangible folk cultural properties “face outward” in a variety of forms, what kind of structures and methods will be needed? And, what kind of challenges and visions will there be? Discussion was exchanged this time on “external power” and inheritance of culture not by limiting the target to disaster-stricken areas, but by covering various regions across Japan that are declining because of depopulation, aging, and urbanization. From the reports on four regions, namely Aomori, Yamagata, Hiroshima, and Okinawa and through the subsequent discussion, a wide variety of topics were posed including not only specific ones such as how to create methods and structures for transmitting attractiveness, but also how to address “tradition” and change, and what meaning it has for a region to make efforts to hand the culture on to the next generation. It was especially impressive to know that all these four regions had never relied on external power from the start in their efforts to hand down culture, but rather the successors and community people surrounding them had continued to choose their own path through numbers of discussions on the ideal way of cultural inheritance and through trials and errors. The Conference this time gathered more participants than in past years, including many who were actually engaged in cultural inheritance activities in an organization working on conservation of intangible cultural heritage. It not only indicated a rising interest in the issue of having intangible cultural heritage “face outward” but also renewed our recognition of how serious the patrimony issue is for the parties concerned. 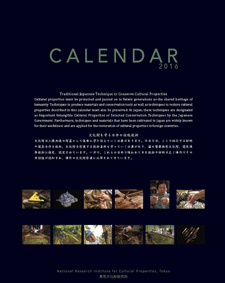 The report of the Conference was published in March 2016 and was posted on the website of the Department of Intangible Cultural Heritage. On December 18th, the Department held the Public Lecture under the title of “Melody and Accent of Japanese Music―from the Medieval Period through the Early Modern Period―” (at Heiseikan Auditorium). 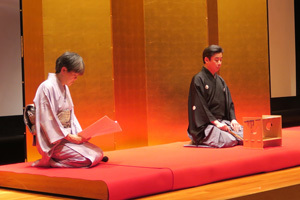 With the focus on Noh (Noh chant; a medieval performing art) and Nagauta (long epic song; an early-modern performing art), the lecture was delivered jointly with Professor Kiyoe Sakamoto of Japan Women’s University, a Japanese language scholar, on the correspondence relation as to how Japanese language accent had its influence over the melody of songs. Then, the participants all enjoyed a stage performance of Noh chant “Matsukaze (wind blowing through the pine trees)” in which the melody of the Momoyama period was restored and a stage performance of Nagauta “Tsuru Kame (crane and turtle)”. It was clearly understood that influential relation varied by category, changed over different time periods, etc. A total of 285 participants were present. Many feedbacks were obtained, which especially mentioned that the content consisting of a lecture combined with stage performances by a Noh player and a Nagauta player was very interesting. 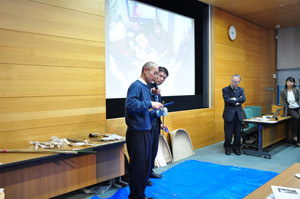 A seminar was held on December 22nd,2015 under the title of “Intangible Cultural Heritage and Disaster Prevention―Importance of Recording for Conservation of Traditional Techniques.” This seminar was organized under the “preparation of dynamic records for cultural properties protection” project that was governed by the National Research Institute for Cultural Properties, Tokyo as a part of the promotion program of the National Taskforce for the Japanese Cultural Heritage Disaster Risk Mitigation Network. As intangible cultural heritage specifically includes “immaterial” culture, use of recording is considered an important element for the purpose of disaster prevention/disaster reduction. This time, with a focus on the traditional techniques especially in the radiation-affected area in Fukushima Prefecture among the disaster-affected regions of Great East Japan Earthquake, two cases were introduced using the pre-disaster and post-disaster records to show what efforts have been underway towards disaster prevention and reconstruction. The cases introduced were “Obori-Soma Ware” of Namie Town, Fukushima Prefecture, and “Odaka Winnowing-Basket Making” of Minami-Soma City. The case of “Obori-Soma Ware” showed the reconstruction efforts that were in progress after the workshops had moved out of Namie Town after the disaster. 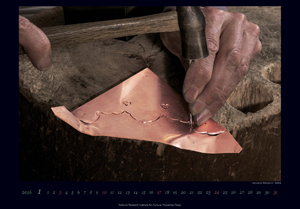 Further, in the case of “Odaka Winnowing-Basket Making,” the current efforts to restore the technique by referring to the videos that had been recorded before the disaster were introduced. Further to explain acquisition of skill obtained in the recorded video, a part of the actual making process was demonstrated while discussion was held about importance of recording in intangible cultural heritage. As we need to think of a wide variety of cases for disaster prevention of the intangible cultural heritage, there is no single best answer to it. Based on continuous discussion, we will keep making efforts to contribute to disaster prevention/disaster reduction of the cultural heritage. 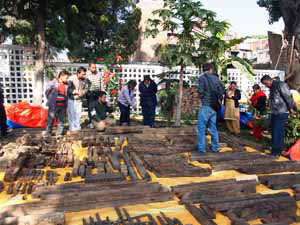 A field survey was conducted in Nepal from 21 November to 8 December as a part of the “Japan’s International Contribution to Protection of Cultural Heritage” program commissioned by the Agency for Cultural Affairs, Japan. Based on results of the briefing survey that had been conducted in September on the disaster-affected cultural heritages in Kathmandu Valley of World Heritage, the survey this time conducted Kathmandu Durbar Square of World Heritage Site and Khokana Village that was listed on the Tentative List of World Heritage for its remaining historical townscape. 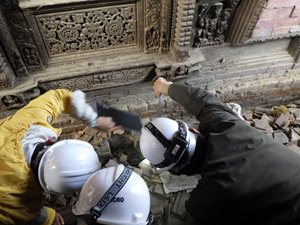 In the Kathmandu Durbar Square, Traditional techniques of historic buildings team carried out a “survey on the extent of cultural heritage damage” and Structural engineer team carried out “3D measurement” and “micro-tremor measurement.” Further, as a part of emergency preservation measures, with regard to appropriate management and documentation of timber members salvaged from collapsed temples,. a workshop on the classification, recordkeeping, and storage methodology was conducted with local experts to transfer this technical knowledge. In Khokana, on the other hand, This comprehensive, in-depth survey considered the settlement space from a cultural perspective, the extent of cultural heritage damage, the historical development of urban typologies, structural impacts, including micro-tremor measurements, intangible heritage impacts, and water quality. In the case of a historical settlement that has been disaster stricken, people who are disaster victims tend to consider that “speedy reconstruction of their houses” and “inheritance of historical townscape” are two contradictory issues. 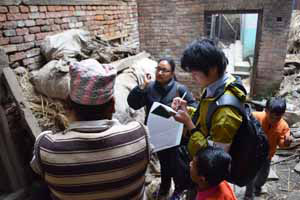 In order to address this difficult challenge and contribute to developing the reconstruction plans, the survey was conducted by accurately gathering information from the perspective of cultural heritage in cooperation with Khokana Reconstruction and Rehabilitation Committee, an organization consisting of local residents who were highly-motivated to inherit their history. We are planning to continue the survey and to feed back the fruit to the local stakeholders in a speedy manner.